Hey, have you heard? 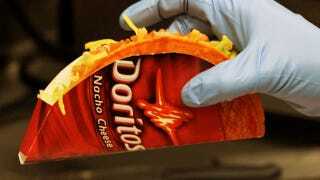 Taco Bell has sold over 100-million of its Doritos Tacos Locos, the nuclear weapon of the fast food franchise—and it's been only 10 weeks since they launched! This is disturbing information, I think! As Brian Fung points out over at The Atlantic, it took McDonalds 18 years before they finally sold their 100 millionth burger! So, what exactly are you gorging on, you Locos little piggies? 10 weeks = 17 billion calories; 900,000 grams of fat; 2.5 million grams of cholesterol, and 34 million grams of sodium. Fung calculated that, based on a 2,000-calorie diet, at that rate Taco Bell could feed the entire population of Hong Kong for a day, with leftovers to spare. And "if you combined all the tacos into a single, monstrous taco, it would weigh 17.2 million pounds—as much as four space shuttles at liftoff." The upgraded Supreme Locos would weigh almost 25 million pounds, containing over 20 billion calories, more than a million grams of fat, and 3.5 million grams of cholesterol. Calorie wise: a hundred million of these tacos could feed 10 million people for a day.